Buzz Lightyear: That's our guy! Hamm: I knew there was somethin' I didn't like about that chicken. Hamm: Excuse me, ladies, but could any of you tell us where we might the Al of Al's Toy Barn? Tour Guide Barbie: I can help! Tour Guide Barbie: I'm Tour Guide Barbie! Please keep your hands, arms, and accessories in the car, and no flash photography. Thank you. Hamm: Then make way for the single fellas. Buzz Lightyear #2: [thinks the approaching elevator is walls closing in] Quick! Help me prop up Vegetable Man, or we're done for! Woody: [Jessie shuts off the TV as the "Woody's Roundup" episode ends] Hey, w-wait, What happened? What happens next? Come on, let's see the next episode! Stinky Pete: The show was cancelled after that. Woody: Wait, wait, wait. What about the gold mine and... and the cute little critters and the dynamite? That was a great show! I mean, why cancel it? Stinky Pete: Two words: Sput-nik. Once the astronauts went up, children only wanted to play with space toys. Woody: ...I know how that feels. Mr. Potato Head: Will you just leave me alone? Mr. Potato Head: Where is he going? He's nuts! Slinky Dog: His arm ain't that bad! Rex: Don't do it, Woody! We love you! Mr. Potato Head: Oh, you had to bring that up! Hamm: All right, let's review this one more time. At precisely 8:32-ish, Exhibit A, Woody, was kidnapped. Hamm: Exhibit B, a composite sketch of the kidnapper. Bo Peep: He didn't have a beard like that. Hamm: Fine. Uh, Etch, give him a shave. Slinky Dog: The kidnapper was bigger than that. Hamm: Oh, picky, picky, picky. Mr. Potato Head: Oh, let's just go straight to Exhibit F! The kidnapper's vehicle. Mr. Potato Head: Now the vehicle fled the scene in this direction. Hamm: Oh, your parts are in backwards! It went the other way! Hamm: Hey, put a cork in it! Rex: Hey, how do you spell F-B-I? Mr. Potato Head: My crime scene! Hamm: Hey, watch where you're going, Godspilla! Rex: I didn't know this was a crime scene! Buzz Lightyear: Buzz, are you coming? Buzz Lightyear #2: No, I... I have a lot of catching up to do with my dad. Emperor Zurg: Good throw, son. That's my boy! Go long, Buzzy! Buzz Lightyear #2: Oh, you're a great dad. Yippee! Alien toys: Ooooh! Strangers! From the outside! Buzz Lightyear: [groans] Oh, no! Woody: I know! It's okay, Buzz. I actually want to go. Mr. Potato Head: What? Are you crazy? Woody: Look, the thing is, I'm this rare "Sheriff Woody" doll, and these guys, are my - round-up gang. Buzz Lightyear: Woody, what are you talking about? Woody: What am I talking about? "Woody's Round-Up"! Oh, it's this great old TV show, and I was the star. Woody: See, look, that's me! Hamm: This is weirdin' me out. Andy: You must choose, Sheriff Woody. How shall she die? Shark, or death by monkeys? Rex: No, no, no, no. Buzz Lightyear: Oh, you almost had him. Buzz Lightyear: Sure, you will, Rex. In fact, you're a better Buzz than I am. Buzz Lightyear: Woody once risked his life to save mine, and I couldn't call myself his friend if I wasn't willing to do the same. Now who's with me? Rex: [Rex is running to catch up with the toy car Barbie is driving] Hey guys! Wait for me! Tour Guide Barbie: Remain seated, please! Permanecer sentados, por favor! Buzz Lightyear: [looking at another toy of himself] Am I really that fat? Slinky Dog: [the toys are climbing up an elevator shaft. Some coins fall out of Hamm's stomach opening and hit Slinky in the face] Pork bellies are falling. Stinky Pete: Fair? I'll tell you what's not fair: Spending a lifetime on a dime-store shelf watching every other toy be sold! Well, finally my waiting has paid off, and no hand-me-down cowboy doll is gonna mess it up for me now! Rex: Guys, we can't park here. It's a white zone. Woody: I have no choice, Buzz. This is my only chance. Buzz Lightyear: To do what? Watch kids from behind glass and never be loved again? Some life. Buzz Lightyear: You still worried? Woody: About Andy? Nah, it will be fun while it lasts. Buzz Lightyear: I'm proud of you, cowboy. Woody: Besides, when it all ends I'll have old Buzz Lightyear to keep me company - for infinity and beyond. Slinky Dog: Pardon me, gentlemen, but have either of you seen a cowboy doll with a bad arm? Blue Rock 'Em Sock 'Em Robot: [politely] Why, no. I haven't. Red Rock 'Em Sock 'Em Robot: [yelling] Hey! He was talkin' to me! Blue Rock 'Em Sock 'Em Robot: No! He was talkin' to me! Red Rock 'Em Sock 'Em Robot: Why, you! I'll...! Woody: Here's your list of things to do while I'm gone: batteries need to be changed. Toys at the bottom of the chest need to be rotated. Oh, and make sure everyone attends Mr. Spell's seminar on what to do if you or part of you is swallowed. Okay? Okay, good, okay. Woody: [Woody's arm finally rips completely off] Ah! It's gone! I can't believe it! My arm is completely gone! Stinky Pete: All right. Come here. Come on. Let me see that. Oh, it's just a popped seam. Easily repaired! You should consider yourself lucky. Woody: Lucky? Are you shrink-wrapped? I am missing my ARM! Jessie: Let him go! I'm sure his precious Andy is dying to play with a one-armed cowboy doll. Stinky Pete: Now, Jessie, you know that he wouldn't last an hour on the streets in his condition. It's a dangerous world out there for a toy. Buzz Lightyear #2: Hang tight everyone, I'm going to let go of the wall. Mr. Potato Head: He wouldn't! Slinky Dog, Rex, Mr. Potato Head, Hamm: DON'T DO IT, BUZZ! Buzz Lightyear #2: To infinity and beyond! Approaching destination. Reengaging gravity. Buzz Lightyear #2: Area secure. Buzz Lightyear #2: It's OK troops, the antigravity sickness will wear off momentarily. Now, let's move! Mr. Potato Head: Remind me to glue his helmet shut when we get back. Woody: Bullseye, are you with me? Woody: Ah! Okay! Good boy. Woody: Prospector, how 'bout you? Stinky Pete: [talking to two Barbie dolls] ... And so you two are absolutely identical? Stinky Pete: You know, I'm sure I could get you a part in Toy Story 3. Stinky Pete: yes, any time you'd like some tips on acting I'd be glad to chat with you. Alright, off you go, then. Mr. Potato Head: Oh, let's just go straight to Exhibit F - the kidnapper's vehicle was seen fleeing in this direction. Hamm: Oh, your parts are in backwards, it's this way! Mr. Potato Head: Hey, put a cork in it! Rex: [walks over, knocking things everywhere] Hey, how do you spell F-B-I? Buzz Lightyear: Excuse me, excuse me, a little quiet please! Thank you. Geri the Cleaner: [standing outside to door of Al McWiggan's apartment] Is the specimen ready for cleaning? Andy: Hey, Woody! Did you miss me? Andy: Giddyup, giddyup, giddyup, ridin' cowboy! Andy: [depressed] Oh, I forgot, you're broken. I won't even play with you anymore. Woody: No, no, no, no, no! Geri: Here you go. [closes the case] He's for display only. Ya handle him too much, he's not gonna last. Al: [excitedly] Oh, it's amazing! You're a genius! He's just like NEW! Andy's Mom: Andy, honey, come on! Five minutes and we're leaving. Andy: [as Bo Peep] Help, help, somebody help me! Andy: Let her go, evil Doctor Pork Chop! Andy: Nevar! You must choose, Sheriff Woody. How shall she die? Shark? Or death by monkeys? Andy: Ooh ooh ooh, ah ah ah! Andy: I choose Buzz Lightyear! Andy: [as Hamm] What? That's not a choice! Andy: [as Buzz] To infinity and beyond! Andy: [as Woody] I'll save you, Miss Peep! Andy: My hero! Mwa mwa mwa mwa! Andy: [as Woody] Thanks, Buzz! 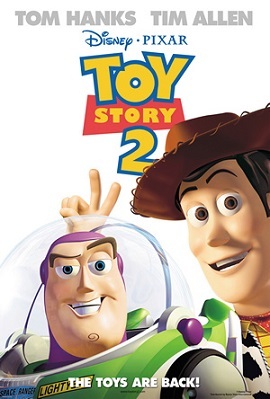 Andy: You should never tangle with the unstoppable duo of Woody and Buzz Lightyear! Andy's Mom: Andy? Let's go! Molly's already in her car seat! Andy: But Mom, Woody's arm ripped! Andy's Mom: Oh no! Well maybe we can fix him on the way. Andy: Nah, just leave him. Andy's Mom: I'm sorry, honey, but you know, toys don't last forever. Mr. Potato Head: I found it. Woody: You found my hat? Mr. Potato Head: Your hat? No. The missus lost her earring. Oh my little sweet potato! Mrs. Potato Head: You found it! Oh, it's so nice to have a big, strong spud around the house. Woody's Roundup Announcer: Will Woody and Bullseye land to safety? Can they reach Jessie and Stinky Pete in time? Tune in next week for the exciting conclusion: "Woody's Finest Hour"! Woody: [after dealing with Prospector] I think it's time that Prospector learned something called playtime. Woody: Right over there guys! Stinky Pete the Prospector: No, no, No! Amy: [offscreen] Look, Barbie! A big ugly man-doll! Ooh, he needs a makeover. Barbie: Hi, you'll like Amy. Buzz Lightyear #2: Oh no, the walls are closing in! Buzz Lightyear #2: Quick, help me prop up Vegetable man here or we're done for! Woody: [deep voice] Excuse me, ma'am, but I believe you're on the wrong flight. Jessie: That was definitely Woody's finest hour! Woody: Jessie, let go of the plane! Jessie: What? Are you crazy? Woody: Just pretend it's the final episode of "Woody's Roundup". Jessie: But it was cancelled! We never saw if you made it! Woody: Well, then, let's find out together! Stinky Pete the Prospector: Idiots! Children destroy toys. You'll be ruined, forgotten, spending eternity rotting on some landfill. Woody: Well, Stinky Pete, I think it's time you learned the true meaning of playtime. Rex: [as Al drives off] How are we going to get him now? Mr. Potato Head: Pizza, anyone? Buzz Lightyear: Woody, stop this nonsense and let's go. Woody: I can't go. I can't abandon these guys. They need me to get into this museum. Without me, they'll go back into storage. Maybe forever. Buzz Lightyear: Woody, you're not a collector's item, you're a child's plaything. You are a toy! Woody: For how much longer? One more rip, and Andy's done with me. And what do I do then, Buzz? Huh? You tell me. Buzz Lightyear: Somewhere in that pad of stuffing is a toy who taught me that life's only worth living if you're being loved by a kid. And I traveled all this way to rescue that toy because I believed him. Buzz Lightyear: Hold it right there! Buzz Lightyear #2: You again? Buzz Lightyear: Woody! Thank goodness you're all right. Woody: Buzz, what is going on? Buzz Lightyear #2: [throws Woody onto the floor] Hold on! I am Buzz Lightyear, and I'm in charge of this detachment. Buzz Lightyear: No, I'm Buzz Lightyear. Buzz Lightyear #2: [arguing with Buzz #1] I'm Buzz Lightyear! Buzz Lightyear: I am Buzz Lightyear! Buzz Lightyear, Buzz Lightyear #2: I am! Buzz Lightyear #2: Don't let this impostor fool you! He's been trained by Zurg himself to mimic my every move. Woody: Your'e right, Prospector. I can't stop Andy from growing up... but I wouldn't miss it for the world. Buzz Lightyear #2: Will somebody please explain what's going on? Buzz Lightyear: It's all right, Space Ranger. It's a code 546. Buzz Lightyear #2: [gasps] You mean it's a...? Buzz Lightyear #2: And he's a...? Buzz Lightyear #2: Your Majesty. Rex: [gasps] What're we gonna do, Buzz? Buzz Lightyear #2: Use your head! Bo Peep: This is for Woody, when you find him. [Buzz Lightyear: [cough] Um, okay, but it won't be the same coming from me. Mr. Potato Head: [in disbelief] Woody's been shelved! Woody: Ride like the wind, Bullseye. Woody: What's that? Jessie and Prospector are trapped in the old abandoned mine and Prospector just lit a stick of dynamite thinking it was a candle and now they're about to be blown to smithereens? Stinky Pete the Prospector: It's your choice, Woody. Either you can go to Japan together or in pieces. He fixed you once, he can fix you again. Now get in the box. Woody: [yelling through the heat duct] Help! Buzz! Guys! Stinky Pete: It's too late, Woody! That silly Buzz Lightweight can't help you. Stinky Pete: Whatever. I've always hated those upstart space toys. Stinky Pete the Prospector: I tried reasoning with you, Woody, but you keep forcing me to take extreme measures. Bo Peep: [amorously] You're cute when you care. Woody: [embarrassed] Bo. Not in front of Buzz. Andy's Mom: I'm sorry, honey, but you know... toys don't last forever. Jessie: You never forget kids like Emily, or Andy, but they forget you. Mrs. Potato Head: [to Mr. Potato Head] I'm packing your extra pair of shoes, and your angry eyes just in case. Tour guide Barbie: And this is the Buzz Lightyear aisle. Back in 1995, short-sighted retailers did not order enough dolls to meet demand. Buzz Lightyear: I'll never give in. You killed my father! Emperor Zurg: No, Buzz. I am your father! Buzz Lightyear: NO! Woody: [lamely] They're called "S'mores", Buzz. Hamm: Too late, I'm in the 40's, gotta go around the horn! Emperor Zurg: So, we meet again Buzz Lightyear, for the last time! Rex: I can't look. Could somebody please cover my eyes? Woody: Oh, you should have seen it. There was a record player. And a yo-yo. Buzz, I was a yo-yo! Mr. Potato Head: [to Hamm] WAS? Al McWiggin: To overnight, 6 packages to Japan is how much? What? That's in yen, right? DOLLARS?'! Oh, you are deliberately takin' advantage of people in a hurry! You know that?'! Slinky Dog: How are we going to get up there? Rex: Maybe if we found some balloons, we could float to the top. Al McWiggin: So, uh, how long is this gonna take? Geri the Cleaner: Ya can't rush art. Hamm: All right, nobody look till I get my cork back in. Buzz Lightyear: To Al's Toy Barn... and beyond. Hamm: Turn into the spin, Barbie! Stinky Pete: You're just fannin' the flames, Jessie. It takes brains to put out that fire. Stinky Pete: Yeow! My biscuits are burning! Mrs. Potato Head: You saved their lives? My hero! They're so adorable. Let's adopt them! Rex: Buzz, you could have defeated Zurg all along! You just got to believe in yourself! Emperor Zurg: Prepare to die. Rex: Aah! I can't look! Rex: I did it! I finally defeated Zurg! Buzz Lightyear #2: [forlornly reaching down at the abyss] Father. Jessie: You callin' me a liar? Jessie: [adjusting her hat] Say that again. Woody: [slowly] If the boot-tuh fits! Slinky Dog: Buzz, Buzz! My backend's going to Baton Rouge! Slinky Dog: We've been down this aisle already. Mr. Potato Head: We haven't been down this aisle, it's pink. Slinky Dog: Face it, we're lost. Rex: How do you spell FBI? Mr. Potato Head: I say we stack ourselves up, push the intercom and pretend we're delivering a pizza. Hamm: How about a ham sandwich? With fries and a hotdog? Hamm: Ah, you can be the toy that comes with the meal. Mr. Potato Head: Can we stop? My parts are killing me. Buzz Lightyear: How about a quick roll call? Everybody here? Mr. Potato Head: Not everybody. Ham: I seriously doubt he's getting this kind of mileage. Hamm: Where did you get the cool belt, Buzz? Buzz Lightyear #2: Well, slotted pig, they're standard issue. Hamm: You heard of Kung Fu? Well get ready for pork chop. Slinky: Ah, this fella says he needs to go out back for a little private time? Buzz Lightyear #2: Has your mind been melted? You could have killed me, Space Ranger. Or should I say "traitor." Buzz Lightyear: I don't have time for this. Buzz Lightyear #2: Buzz Lightyear to Star Command. I have an AWOL Space Ranger. Buzz Lightyear #2: No back talk! I have a laser, and I will really use it. Buzz Lightyear: You mean a laser that's a lightbulb? Buzz Lightyear #2: Has your mind been melted? You could have killed me, Space Ranger! Or should I say, "traitor?" Buzz Lightyear: Uh, ma - ma'am? I, uh, um, well, I just wanted to say you're a bright young woman with a beautiful yarn full of hair. A hair full of yarn. It's ah... um... I must go. Jessie: [brings him back] Well aren't you just the sweetest space toy I ever did meet! Stinky Pete: How long will it last, Woody? Do you really think Andy is going to take you to college, or on his honeymoon? Andy's growing up, and there's nothing you can do about it. It's your choice, Woody. You can go back, or you can stay with us and last forever. You'll be adored by children for generations. Woody: [pets Bullseye the Horse, then suddenly decides to stay] Who am I to break up the Roundup Gang?